During any Double Threat Charter you can come into contact with sharks. Lemons, nurses, and blacktips prowl Biscayne Bay flats and bulls, hammers, lemons, and countless other species hunt the ocean side channels and deeper waters surrounding Miami's coast. For those who are interested in targetting sharks specifically, a Miami shark fishing trip during the summer really can't be beat. These fish are anywhere between 4 and 9 feet long, but our typical average is around 6.5'. 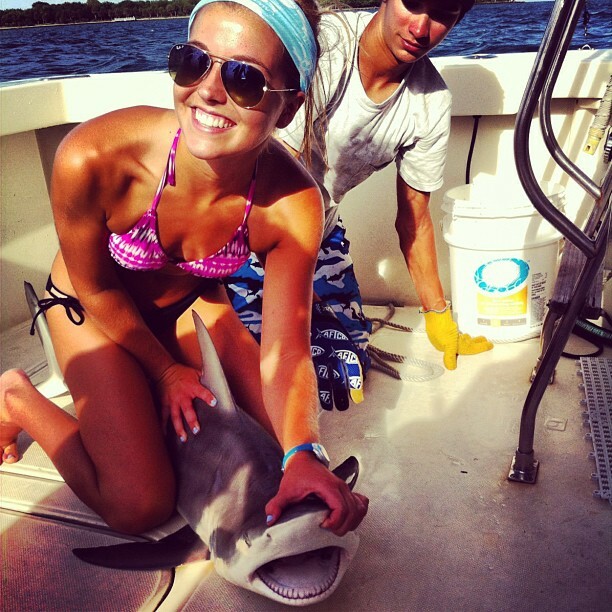 There are two style of shark fishing that Miami is well known for -- land based shark fishing and sharkfishing from a boat. While both target the same species, they are two completely different styles of fishing and demand entirely different tackle and tactics. Our trips are solely from boats, so our report reflects those tactics that work best for us. Our Miami shark fishing trips use very straightforward rigs that evolved from some of our offshore trolling and swordfishing tactics. We like to use wind on leaders to protect the mainline from chaffing, and employ a long wire leader to protect against the sharp teeth sharks are so notorious for. Even though many may think that big hooks are required for shark fishing, we have had our best ratios with smaller sizes. Two short shank mustad 8/0 hooks rigged in tandem (similar to a stinger rig) on the wire leader has done us very well on hook up ratios. Both hooks are pinned into the bait and the second hook really has proven itself more often than not for getting the hookup. The smaller sized hook is easier to set because of its thinner gauge, and overall is less destructive to the fish in the event we have to cut the leader. The hooks rust out over time as well minimizing the damage we do to the fish. It is imperative that reels are spooled to max capacity due to the size and aggressiveness of these gamefish. All of our reels are spooled with 500 yards of Bullbuster premium braided line, and then topped off full with 50lb Bullbuster monofilament fishing line. 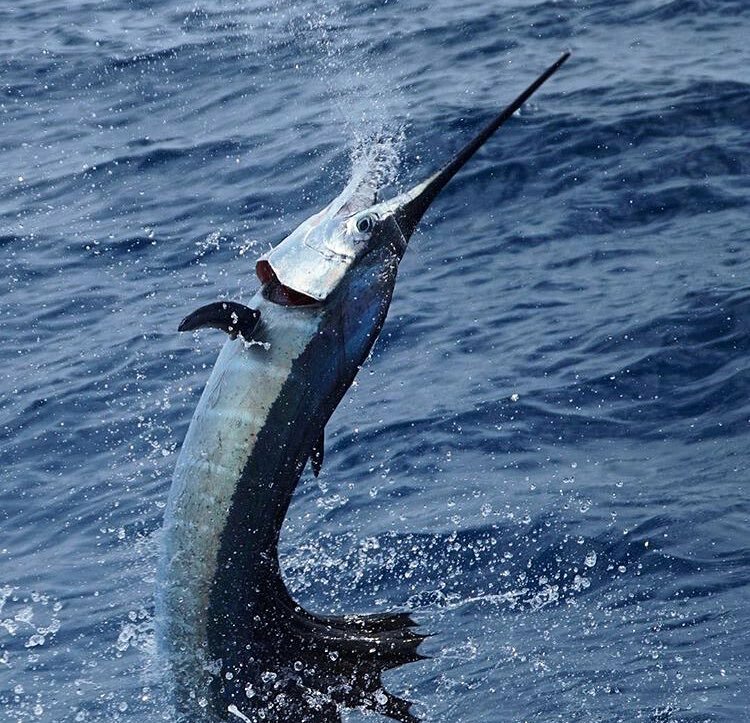 This gives us our best chance to fight and land the biggest bulls and hammerheads that do eat our baits, while keeping it sporty for the smaller fish. Considering we have to be ready for anything from 4' blacktips to 12' hammerheads, its to our advantage to be prepared. Our leader system is very straight forward to cut down on rigging times but also retain fool proof connections for when those giant hammerhead sharks and bull sharks come out to play. On our larger setups we employ 20' 125lb bullbuster mono wind on leaders that are attached to the mainline via a cats paw connection (loop to loop with a 2' bimini twist). From here we crimp a 300lb swivel to the leader, and attach 10' of #16 wire to the other end. The leader terminates with our tandem hook rig described above. 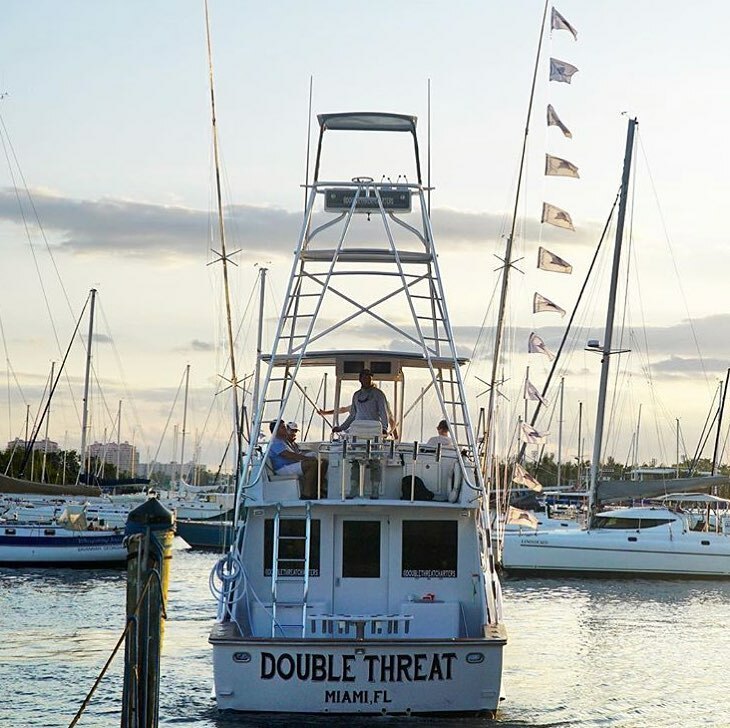 Our smaller setups employ the same wire leader system, except we prefer to use 10' bimini twists attached to the upper end of the swivel instead of wind on leaders. The wind on is great for large fish and high stress situations, but it takes up a lot of space on the reel's spool. On our smaller reels we like to reserve that space for more mainline for the sharks' long runs, because the wire typically protects the line for the majority of situations. Its a hard line to walk when choosing appropriate tackle for shark fishing. If setups are over sized and too big, the fight can be a lot less enjoyable on the majority of the fish you come face to face with. In a sense it is better to be overly prepared, but sometimes the combos that people use are meant for that once in a life time fish and that just doesn't make sense. At the same time though, combos that aren't suited for the job can, and will, be humbled. Getting spooled is an awful experience that can be avoided. Aboard the Blue Yonder we use Shimano Tiagra 30wlra's on rods rated for 20-50 lb line for the larger fish we encounter. These setups have the back bone to turn large bullsharks and lift heavy fish from deep water. With that said though, these combo's are very enjoyable to use and still have the capabilities needed for when a 9'+ fish eats a bait. We have the utmost confidence in these setups for that fish of a life time. As medium and lighter duty outfits we employ Penn senator 6/0's and 9/0s. Both reels are matched to 20-50 lb rods that are a blast to use on smaller blacktips and bullsharks, but again they still have the capabalities to turn larger fish if they end up eating the baits. The smaller reels have more braided line as well, maximizing the overall line capacity. The jury is out on what bait is the "best" for miami shark fishing. A number of captains swear by tuna and kingfish, while others like mackerel and ladyfish. We can personally attest to the fact that sharks will eat anything. We have used squid in a bind and still caught fish. Our bait choices are determined by what is readily available and also what works, not just one or the other. Barracuda is a great shark bait because of how easily they are to acquire and also how much they wreak. Sharks can't seem to get enough of them either, so that's always a plus. We like to chum the larger carcasses and setup a slick, while sending out 4" by 12-14" baits into the current. Big baits attract fish but the hookup ratio's are poor. This sized bait (with a tandem rig set into it) is a perfectly sized chunk for every sized shark we may encounter, and it has an excellent hook up ratio. 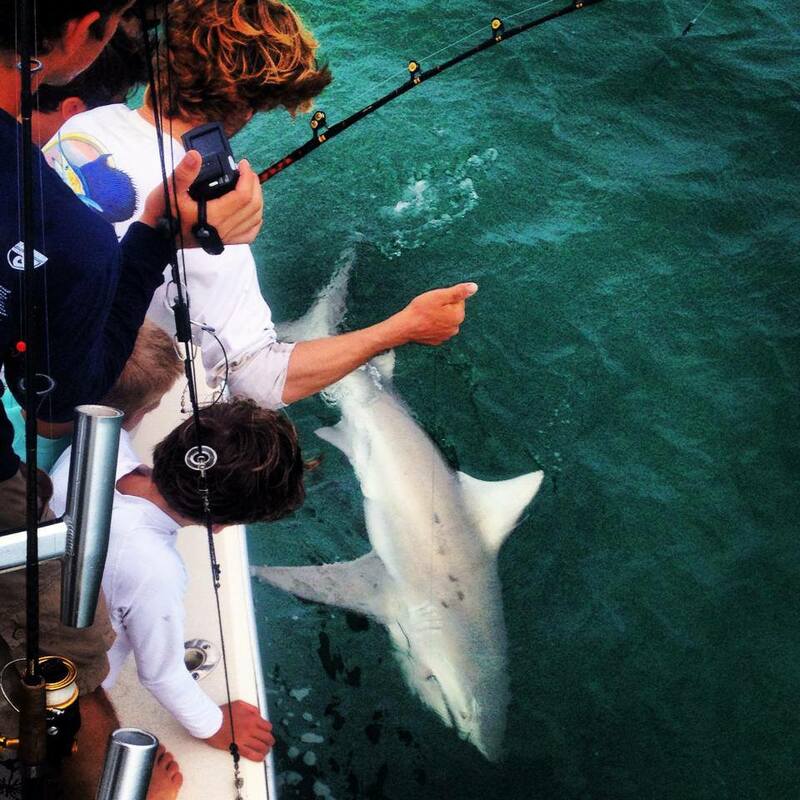 Miami shark fishing trips are an exciting and easy way for anglers to connect with big game fish close to home. Sharks are incredibly hard fighters and never give up, even when at boat side. So far this season our best days have seen 5 fish caught in only two hours, so the bite can definitely get exciting very quickly. 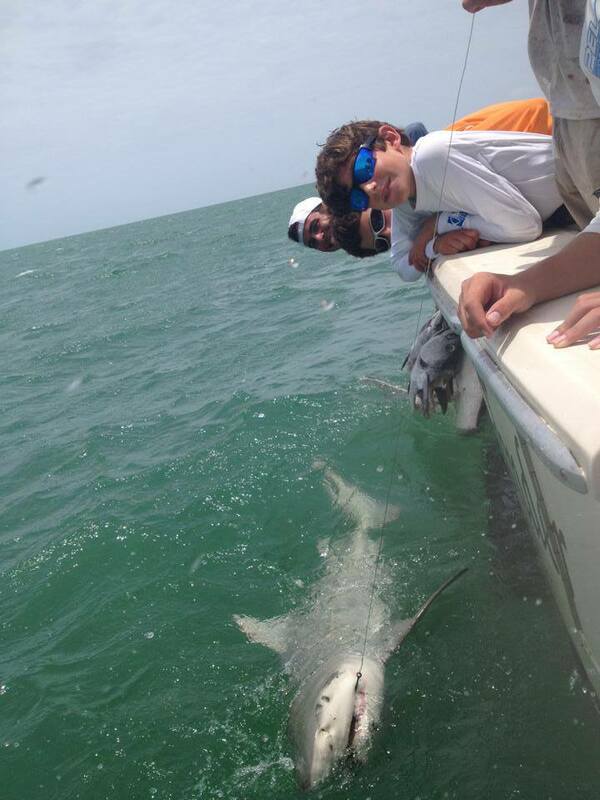 We even had a triple header of 150-200lb bullsharks, that was interesting to say the least. Whatever your reason may be, keep sharks in mind the next time you want to go fishing in Miami.